With property sizes in Sydney shrinking (see footnote), if you’re lucky enough to have space for a carport you’ll probably want to get as much use out of your asset as possible. That’s why a versatile Sydney carport is a good idea and well worth considering. By versatile we mean a carport that can also double as an entertainment area when friends or family come around. This dual use will work especially well if you have an existing small outdoor living area. While this will be a great place for you and your family to relax and enjoy barbecues, a small outdoor room will quickly go from cosy to cramped once you invite several people around. Any decent, well-designed carport will double reasonably well as an occasional entertainment area. As long as it has a roof, of course! So how can you make it even more comfortable and inviting when groups drop around? Firstly, move the cars onto the street! Consider your furniture requirements. If you only entertain large groups occasionally, you may consider using your inside furniture. But if you entertain more regularly this will soon become a hassle. Folding tables and chairs that you can store close by and a barbecue on wheels can be an excellent solution. While rain might be inconvenient, combine it with wind and your guests will soon be running for cover. To make your carport / entertainment area more comfortable in any weather, you might consider enclosing the sides and rear. Another excellent option to think about is outdoor blinds. If your carport doesn’t have lights, get a sparky around to install some lighting. If you’d prefer not to go to the expense, garden lights, party lights and fairy lights can provide ‘mood’ lighting for parties that go into the night. If you think property sizes in Sydney are shrinking while real estate prices are soaring, you’d be on the mark. Housing Industry Association figures show that a standard Sydney property has shrunk from around 312 square metres in 2010 to around 285 sqm today, or approximately 0.07 acres. Gone are the days of the quarter acre block! 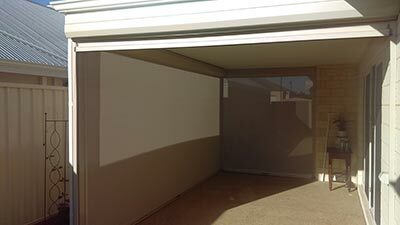 Want to build a Sydney carport that can double as an occasional entertainment area? Give Mr Carports a call on 1800 557 782 or go to our Sydney branch page for more information. ‹ Melbourne carport lights up!